Samsung, the Korean-based technology giant, is in every market, in every geography, and that includes fleet management, transport and logistics. Dawson spoke to Fleet Auto News on the side of a transport and logistics summit hosted by Samsung in Melbourne in early September. He is responsible for the Samsung Knox portfolio within the enterprise business team. 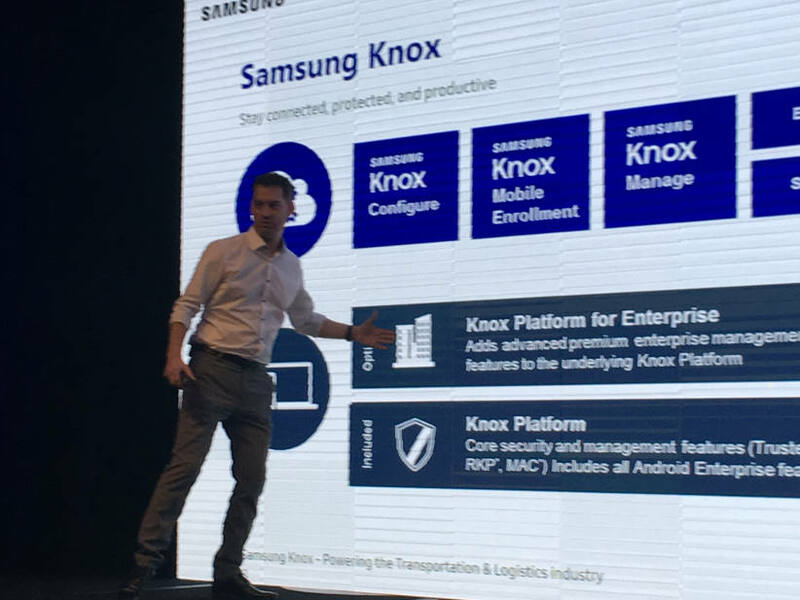 Knox, launched about five years ago, combines device security with advanced management solutions, enabling Samsung devices to be used in among other things fleet management, transport and logistics. In fact, as Dawson explains it was the US fleet management industry that tipped Samsung to develop the Knox offering. Samsung teamed up with US telecommunications provider Verizon which developed fleet management software that could be used by US logistics companies and drivers to log their hours, and manage their service. The partnership paved the way for Samsung to sell its devices, including phones and tablets. Telstra-owned MTData has teamed up with Samsung’s Knox to provide fleet management solutions for Australia’s largest privately owned transport company Linfox, which runs about 5,000 trucks. Elsewhere, Switzerland’s railway group SBB uses the Knox platform to update all of its employees’ devices. Another reason for building the Knox security platform was that android devices weren’t fully trusted. The Knox security is now built into every Samsung device and unlike its competitors that only do upgrades when devices are turned off, Knox updates live. This feature enables Fleet Managers to update software on all devices used in their vehicles and by their drivers at any time. Samsung’s fleet management offerings also came about following the tech company’s hookup with Harmin which provides infotainment systems in cars and planes. “That same base of technology, and the distribution and mechanism to get that system into the vehicle, and updated in vehicles; we are applying that same logic to fleet management solutions,” said Dawson.